I have a few recipes that I go to again and again. This stir-fry is one of them. I can't get enough of this peanut sauce, I always have the ingredients on hand, and it is chock full of veggies. It is also a very versatile recipe and can be made with many different veggies. I will give you some vegetable ideas below, but feel free to include other veggies if you like. 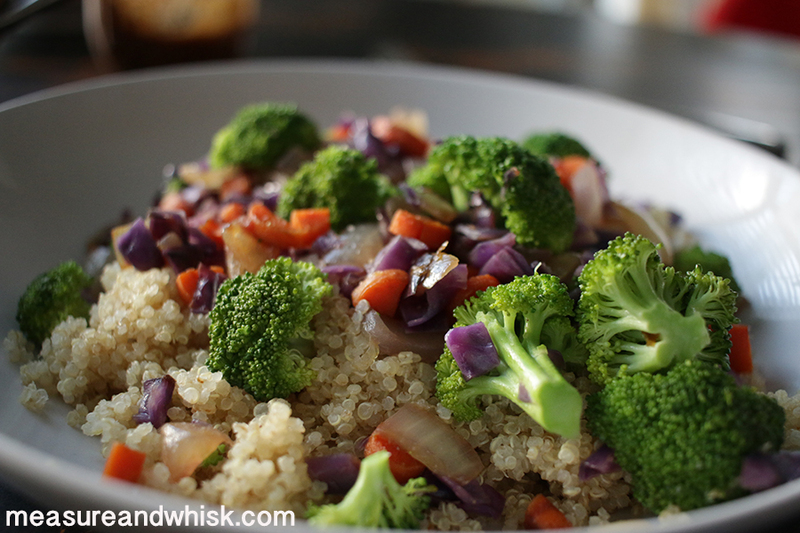 Also, I sometimes use quinoa with this, and sometimes I use rice; both taste good. I do think a really good hoisin sauce is key. This hoisin sauce is the kind I always use, and I love it. It is not as bitter as some hoisin sauce, and is a perfect compliment to the salty peanut butter. If you make it, let me know on instagram (@measureandwhisk), or email me! I love hearing your feedback on recipes! In a jar, combine the ginger, peanut butter, and hoisin sauce. Stir and then add the hot water, a little at a time, until it reaches the desired consistency. In a large frying pan, heat the oil, and add the garlic powder. 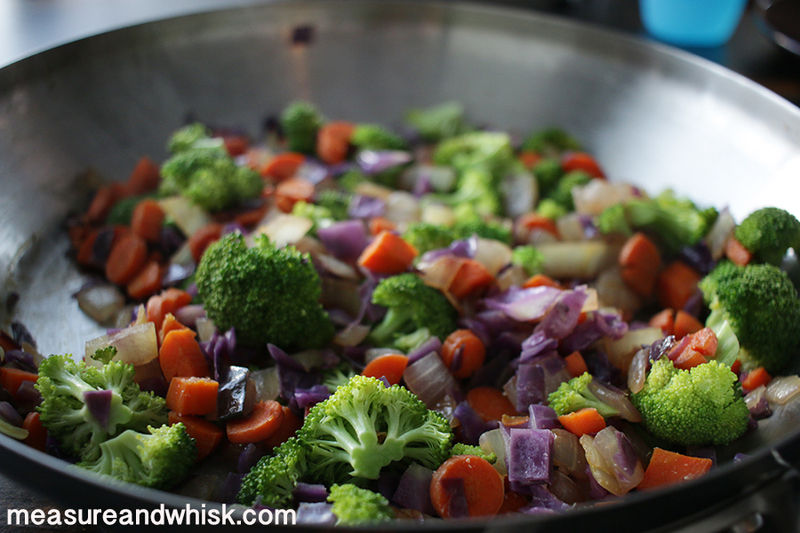 Add the vegetables (except the broccoli... throw that in the last 2 minutes of cook time), and stir fry for 8-10 minutes until the vegetables are soft. 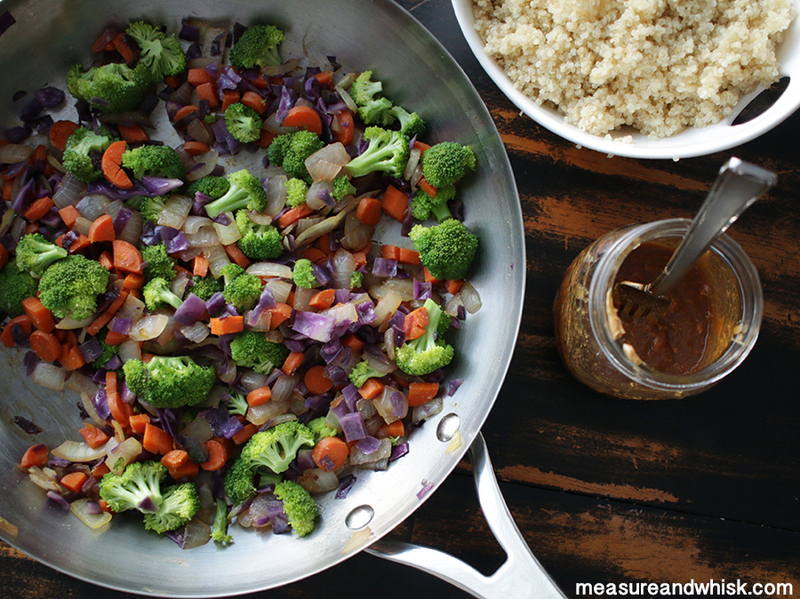 Stir fry is one of my favorite fast dinners to make at home! This one looks amazing! Looking delicious, yummy and healthy. Going to try it soon.